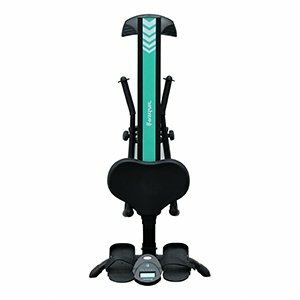 The Harvil RM-1 rower shares many similarities with the Stamina BodyTrac Glider 1060. It’s a hydraulic rower featuring adjustable resistance, a moving seat, and a frame with a folding design. It also includes a basic fitness meter which tracks the most important workouts metrics. It’s not a commercial-grade machine like the Concept2 rower but does have a pretty durable construction. 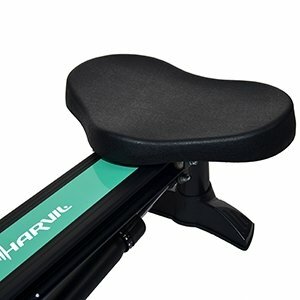 As opposed to the Stamina 1060 rower that we’ve compared it, the Harvil RM-1 features a frame completely made of steel. Its center beam (or seat rail) is also steel made, just as the front frame part and the rear base. All the metallic parts in the unit’s frame are coated with a corrosion-resistant paint; the color used is black, with the top of the rail in green/white colors for an extra aesthetic touch. The unit’s frame also integrates a few ABS parts, though. The rear base stabilizer, the footrests, and several other small covers are some of them. These don’t influence the machine’s overall sturdiness, though. Like most rowing machines with a hydraulic resistance system, the Harvil RM-1 has a very small footprint. With the frame fully set up, it’s 50″ (127 cm) long, and 36″ (92 cm) wide. The oars exceed the 36″ inches width by a few inches though. So, as a general idea, you will need a usage surface for this machine off at least 60″L x 50″W (153 x 127 cm). The machine’s frame is foldable. To be more specific, the unit’s moving arms can be folded alongside the rail, in order to reduce its width. The folded unit can be stored vertically, resting on its front part. However, the console mast cannot be folded. The console stands at approx. 20″ (51 cm) above floor level. So, in case you’re wondering, you cannot store the unit under a bed, unless the clearance under the bed is over 20″ (51 cm). The unit’s rail is approx. 44″ (111 cm) long. This being said, the unit can accommodate users up to 6’3″ (190 cm), promoting a complete leg extension. The unit’s rail is pretty sturdy, as well. Several sources specify a user weight capacity for it of 265 lbs (120 kg). However, the manual only recommends this machine for users up to 250 lbs (113 kg). The seat doesn’t integrate any cushioning. Its top is slightly molded, though, providing optimal comfort. It’s approx. 14″ (34 cm) wide, and 12″ (30 cm) deep, providing plenty of contact surface. It’s top is anti-slip, preventing you from sliding backward during rowing. The seat frame is metallic. It integrates two sets of high-grade, high-density plastic wheels, with small ball bearings for a smooth operation and a long lifespan. The machine’s oars are made of two parts each. The bottom parts are attached to the resistance cylinder in order to provide resistance when you row. The superior parts of the arms are pivoting and can be rotated independently. This adds a bit of flexibility to the rowing motion, rather than the complete, rigid motion offered by rowers with a pulling cord or chain. Differently put, you can row with a circular motion or a straight motion if you want. The grips on the handlebars are covered by rubber foam, to eliminate stress on the palms, and the formation of blisters. Finally, the machine’s footrests are made of durable ABS material. They’re equipped with adjustable velcro straps and rear guards to provide a perfect foot stability. They have a pivoting design. In other words, you can slightly adjust the angle of your feet with each rowing motion, in order to benefit from the maximum comfort. The Harvil RM-1 rower integrates a hydraulic resistance system, consisting of one cylinder, situated under the gliding rail. The cylinder is connected to the oars and the rear base of the rower, and with each stroke, it extends, generating resistance. 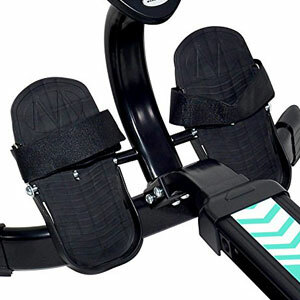 The machine’s resistance is adjustable, featuring 12 levels of resistance. The cylinder has a knob which can be turned to increase or decrease the force required to expand it. In case you’re wondering, the first 3 levels of resistance offer a really light tension, great for users who must undergo a recovery training regimen. The top resistance levels, on the other hand, aren’t too extreme. Overall, this rower can offer light to medium workouts. There are two other important aspects regarding this rower’s resistance system that you should know. First of all, since it’s a hydraulic rower, the cylinder heats up as you row, losing a little bit of resistance. Therefore, after a few minutes of working out, you might need to increase the resistance a bit, in order to maintain the same workout intensity. Second of all, the resistance is constant. Differently put, it doesn’t vary with how hard you pull, as in water rowers or air rowers. Thus, the rowing feel is different from the “natural” one. But on the other hand, since the oars offer a full range of motion, the movement of each stroke is pretty similar to rowing an actual boat. Also, the unit provides a pretty consistent, full-body cardio workout. 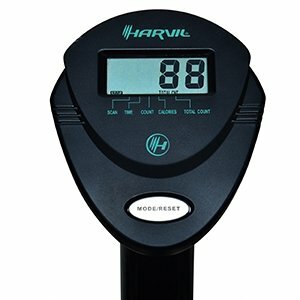 The Harvil RM-1 comes with a basic fitness meter for rowing. It features an LCD display with large digits and only one control button which covers all of its functions. It tracks the main workout metrics, though, including time, count, total count, and calories burned. It doesn’t have a pulse reading function, though. Therefore, if you want to keep in a certain HR interval during your workout, or simply keep an eye on your pulse rate, you will have to use a separate device. The meter unit is very easy to use. It starts up when it detects seat movement or when you press the MODE button. By pressing the button repeatedly you can select one of the metrics to be shown on the display, or select the SCAN function which rotates all the metrics, keeping each one of them on the screen for six seconds. To reset all the values on the meter you can press and hold it for three seconds. The meter uses two AA batteries which are not included. It also has a sleep mode to which will enter if it doesn’t detect seat movement for four minutes, in order to save battery life. The oars and the resistance cylinder are already attached to the main rail. Therefore, you only have to add the rear stabilizer, the seat, attach the rail to the front base, add the console mast, the console, and the pedals. This shouldn’t take more than 30 min. The manual provides clear, step-by-step assembly instructions. Maintenance doesn’t require much. 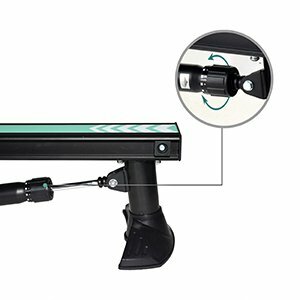 All you have to do is make sure that the gliding rail is always clean, free of any dirt, sand or any small objects that can damage the seat rollers or create nicks into the gliding rail. The Harvil RM-1 is a hydraulic rowing machine, equipped with a 12-level resistance cylinder. It features a set of pivoting oars which promote a natural rowing motion. It has a durable frame, a comfortable seat, and pivoting footrests. In all, it’s an excellent fitness machine for a full-body cardio workout, muscle toning, weight loss, intervals, and stamina development. 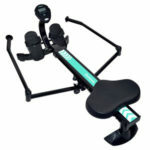 And finally, it’s an affordable rower, currently priced under $150!